Graham, Daniel, their friendship, life and death. Vampires, guardians’ adventures at night. Coffee, love and a new couple. Imli and her mother in a complex web of darkness. A small town girl confused about virginity. Michael Jaikishen and his writing endeavours. Child adoption by a gay couple. Mahabharat – a modern tale in an epic form. The spine-chilling tale of Tina and Uncle Joe. A juicy love story by our guest author Sujata Parashar. These and many other unputdownable stories in this book. 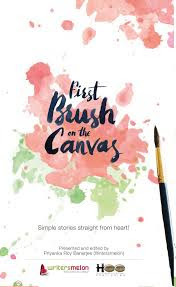 First Brush on the Canvas is an anthology comprising selected stories from Melonade (2014), a nationwide writing marathon organized by Writersmelon dot com. Uttiya Roy – Nourished with Bangla literature, he aspires to change the world someday writing in English. His days pass blending Life Science textbooks with poetry. Upasana Bhattacharjee – We catch ‘em as young as they get! Our youngest writer is still a student, but that doesn’t reflect in the matured story she’s written dealing with inconclusive logics and paradoxes. Stuti Chandra – She writes because she’s alive. This lovely lady is from Patna and has dipped her nose in English Literature at Delhi. Shaily Bhargava – A photographer, a logophile and an Equity Technical Analyst – all in one. She reads and writes in Noida, accompanied by beautiful clicks through her lens and lots of Coffee. Arunav Chowdhury – Have you met this Proletariat Axomiya before? He’s a movie buff and a news junkie rolled into one, who writes wonderful modern takes on the age old Mahabharat. Rafaa Dalvi – A Mumbaikar, an engineer, a blogger and a prolific writer. He’s already made his presence in three anthologies and likes to experiment with different genre. Diptee Raut – A quilter, a blogger, a quirky mom, an amazing writer and our co-winner of Melonade’4. She’s one bundle of positive energy who can spin stories and weave quilts simultaneously. Abhishek Mukherjee – Have you read his blog posts yet? Though he likes to believe he’s only a Cricket Historian, you have to read his humorous takes on Mythology to believe he’s the best. Anwesha Ray – An amazingly sensitive writer, she lives and works in Bangalore with her family. Avishek Basu Mallick – He’s the winner of Melonade’4. If you wish to laud him for more, he’s an engineer and an MBA, working in Bangalore and a featured writer on Sportskeeda. Arijit Ghose – Blend Carnatic music with exceptional satire and the result is Arijit Ghose. Cheeky, expressive and vocal – we hope he becomes a great writer someday. Amit Nangia – For those working in MNCs for years, he’s your inspiration. Amit’s first novel has just released after facing many rejections but that didn’t deter him from writing. Climbing the rocks, gliding in a parachute, bungee jumping or making cocktails; nothing could elevate his spirits as much as writing did. Tnahsin Garg – Tnahsin often exercises his freedom by convincing other folks that ‘free will’ does not exist. His first novel ‘The Prophecy of Trivine’ is a science-fiction based in India. Sujata Parashar – Author of the immensely popular ‘In Pursuit Of’ trilogy, and a wonderful poet. She contributes articles to various websites and magazines, and is a social activist. She’s a guest author in the book.